in effect for the entire post. Riggan Thomson, played by Michael Keaton, is directing and starring in a stage version of Raymond Carver’s short story, What We Talk About When We Talk About Love (henceforth “WWTAWWTAL,” pronounced “wuh-taw-tal”). He’s also trying to reconnect with his daughter and not go completely insane, but it might already be too late on both accounts. My first question: what is the plot of the play Riggan’s putting on? WWTAWWTAL concerns four friends drinking gin and having a discussion about love and abusive relationships. We see Riggan and his costars rehearsing and performing this scene several times, with it getting marginally better each time. This is all well and good, but this is a Broadway play and needs more than just this one scene. We’re shown other scenes in Riggan’s production that don’t seem to come from WWTAWWTAL. There’s a weird scene where one of the two female actresses (Laura or Lesley, I can’t remember which) is in a darkly-lit forest type set and creatures with antlers or branches on their heads are running around. This is never really explained. We also have a final scene where Riggan’s character catches costars Lesley (Naomi Watts) and Mike (Edward Norton) in bed together at a cheap motel. After a brief argument where Riggan brandishes a gun at them both, he commits suicide. It’s unclear if this scene and the forest scene are meant to be continuations of the earlier story about the four friends drinking gin, or if they’re separate narratives entirely. As it happens, WWTAWWTAL is actually the title of a collection of short stories as well as a story within the collection. So is Riggan putting on a play that covers several, or all, of the short stories in WWTAWWTAL? Possibly, but after reading a summary on Wikipedia, I couldn’t find any obvious matches between stories in the collection and the scenes in the forest and the motel. There’s two conclusions: we’re either seeing other short stories by Raymond Carver, or something that’s just made up. I’m never read anything by Raymond Carver, so apologies to any fans if I sound ignorant. My second question is, does Riggan actually have supernatural powers? We see him levitate, perform telekinesis on small objects, fly through the air, talk to his invisible Birdman alter-ego, and fight a giant mechanical bird. Based on how grounded the rest of the movie is, I think it’s safe to assume that Riggan’s powers are just him hallucinating. He’s going crazy from the stress of the play and how much of himself he’s put into it. If it fails, he sees himself as no longer existing. The third big question I have concerns Riggan’s fate at the end of the movie. Is he alive or dead, and if he’s dead, when does he die? We see him try to kill himself three times in the movie, but each time it’s ambiguous as to whether it’s a hallucination. The first attempt happens after Riggan has totally snapped. An important theater critic has just told him that she’ll write a negative review of WWTAWWTAL no matter how good it is. He chugs a pint of whiskey, hears a crazy man on the sidewalk shouting lines from Macbeth and repeating dialog from earlier in the film, and then passes out on some garbage on a door stoop. When he wakes up, he hallucinates his Birdman alter-ego battling a giant mechanical bird with eye lasers. Riggan then levitates up a building and stands on the edge, attracting a crowd of onlookers. He jumps off and hallucinates flying away to the theater, but when he gets there a cabbie chases after him demanding a fare, which suggests that Riggan actually just got down off the building and took a cab. The second attempt is on stage during opening night. When Riggan’s character shoots himself in the final scene, he uses a real gun rather than the usual fake one. The real gun has been hidden in his dressing room for some time before opening night, suggesting he planned his suicide well in advance. Later he wakes up in the hospital, and it’s revealed that he only shot his nose off. The final attempt happens after Riggan learns that his play is a huge success following his suicide attempt on stage. He has a cathartic moment in his hospital room with his daughter, Sam (Emma Stone). Sam leaves, and Riggan sees Birdman again before opening the window in his room and climbing out. When Sam returns to find the window open she looks out, horrified, but then looks up and laughs delightedly, as if Riggan is flying. However, we hear ambulance sirens and calls for help from off-camera, suggesting Riggan actually jumped to his death. It’s hard to tell what, if anything, about the three attempts are real. I personally think the first “attempt” was just him hallucinating during the cab ride. I think he really does kill himself when he shoots himself on stage. The final scene is just a little too perfect to be reality. To me it seems like a near-death vision Riggan has, or some kind of afterlife. He gets exactly he wanted: his play is a hit, and he’s reconnected with his daughter. But after all that he still sees the Birdman, a reminder of his inescapable id, and realizes some kind of universal truth about the futility of trying too hard to matter in other people’s lives. Jumping out the hospital room window is him acknowledging his mistakes and accepting death. 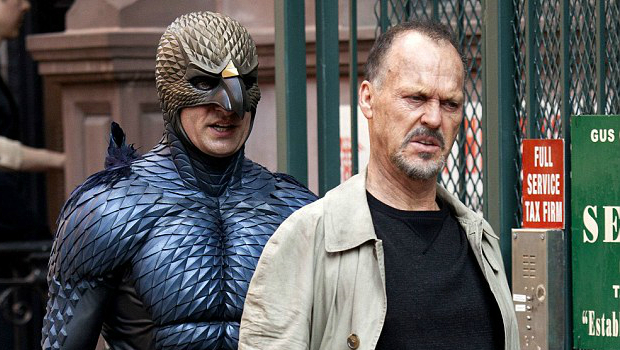 Like I said at the top, this isn’t really a review, but I will say that Birdman is a great movie, even if I didn’t quite understand it. I want to watch it several more times to try and understand everything that happens, and that’s pretty much the highest praise I can give a movie. ← Orion Spacecraft! Oh YEAH!! !